Acid attacks in a village have damaged at least six cars, some so badly they have been written off by insurers. Residents of St Briavels in the Forest of Dean said attacks had been going on for 18 months and have offered a £2,000 reward to help catch the culprits. Officers say a car was extensively damaged as recently as last month and appealed for information. One resident called for those responsible to be arrested before somebody was "seriously maimed". 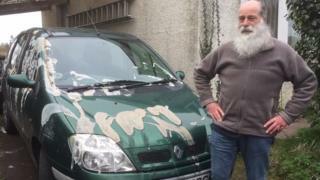 John Hurley, 73, whose car was written off after it was damaged by acid last month, said he was devastated. "It's sad that there's anybody in the community that would do such a thing," he said. Villager Karen Cockfield said she was shocked by the attacks. "It's a very tight-knit community. I have no doubt that these criminals will be apprehended in time," she said. "Let's just hope it's before somebody is seriously maimed. "These are sick crimes by people who need catching." A police spokesperson said a report of a criminal damage had been received on 22 March, when acid was poured over a Renault Megane. "Officers are investigating and would welcome information from members of the public who may have witnessed suspicious activity in the area or have information about who might be responsible," the spokesperson said.